To make the pastry base from scratch, we need to make the pastry dough. Sift all purpose flour, powdered sugar and salt together and put them in a mixing bowl. Cut the cold butter into chunks and add it to the bowl as well. Rub in the butter with your hands till it resembles fine crumbs. Now add just enough cold water to it and mix well till everything comes together into a fine dough. Wrap the dough in cling film and refrigerate for 30 mins. Roll out the dough on lightly floured surface until it is 1/4 inch thick and slightly bigger than the size of your tart pan. Grease your tart pan with removable base lightly. Line the base of the tart pan with the rolled pastry. Press the dough at the sides of the pan slowly and then run the rolling pin once on the pan to cut off the excess dough. Chill the lined pan for 15 mins or so to minimize shrinking before cooking. At this stage you have two options to go about. Either set the toppings on the tart lined pan and bake directly or go for a baking blind method. Choose fresh green apples(Granny Smith). I dint get them, hence used fresh red apples. Cut the top and bottom of the apple and peel the skin using a peeler. Now slice them evenly and arrange them as you like on the tart. Sprinkle sugar and cinnamon powder on top of the apples. Preheat oven to 375°F or 190°C. And place the tart pans on the center rack and bake for 25-30 mins at 190°C. This rather strange term really means just to bake the lined tart without topping. Prick the pastry base with fork to make holes. Now line it with grease proof paper. Half fill the tin with fried macaroni or baking beans to hold the pastry in shape. I skipped the above step and just made enough holes so tat the pastry does not raise when baked. Preheat oven to 375°F or 190°C. Bake at 190°C for 10-15 mins until the base is dry and crisp with a light golden shade. Now allow the pastry to cool down for ten mins and then slightly rub with butter and arranged the sliced apples on top. Sprinkle sugar and cinnamon powder and bake for 25-30 mins at 190°C. This quantity would suffice a 9" pan. But I used two 3" pans and few tartlet moulds. I tried both the methods and the crust was pretty different in both. You can check out for a video of this recipe by Chef Chris Thielman here. You posted this real fast, didn't you? I really like the little tarts. Where did you buy tart pans? Nithya - please visit us here...and make some of these for us! Appreciate all of your patience making these from scratch. They look magical. Now, if only I could have your magic wand for day! 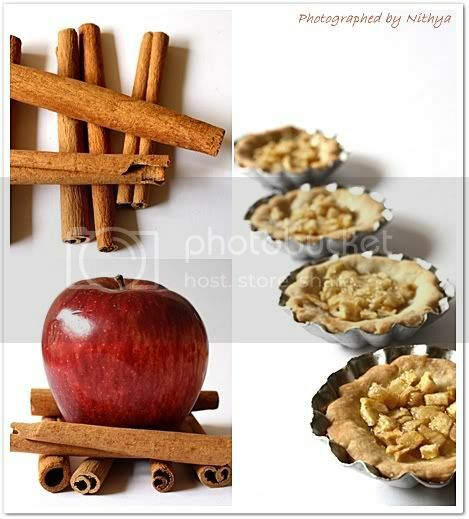 Looks yummy Nithya..I am not so much a fan of tarts but the combo of Apple and Cinnamon is sure tempting!! Cute looking tart, looks pretty and yummy.. 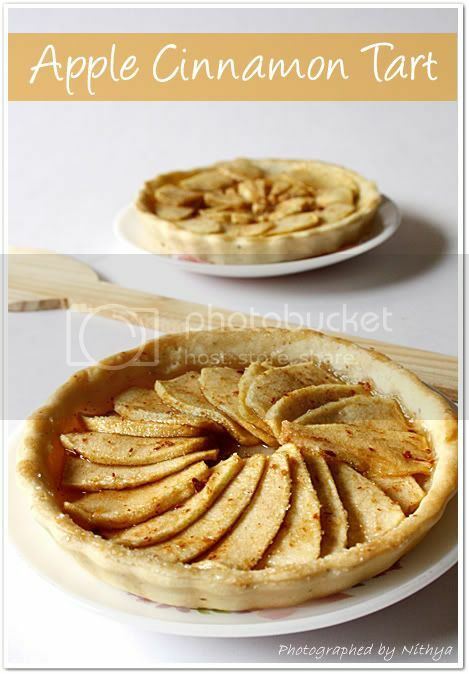 The one thing I adore is apple tart and it looks so beautiful isn't it? 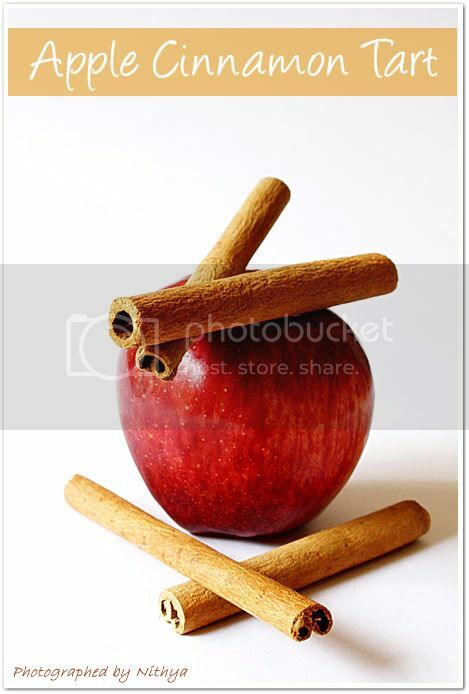 And U did a fab job Nithi..absolute fab..
Love those cinnamon, apple on cinnamon sticks pic a lot ..
Those lovely clicks are making me go crazy. looks so yummy. 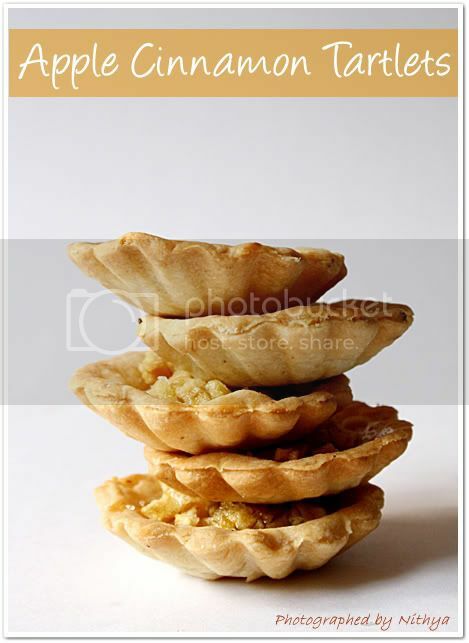 lovely cute and yummilicious tarts with step by step pictures. looks fabulous and amazing ..drooling dish ..wht a tempting pic..
Nithya, that is simply gorgeous. 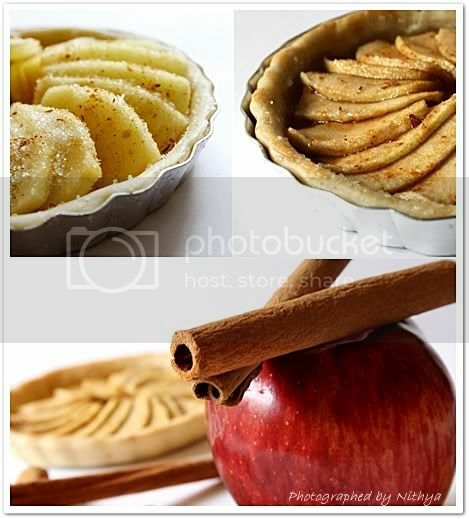 The perfectly shaped apple tarts look simply great. Loved the clicks. Must have tasted simply wonderful. Too good to be true !!! Awesome clicks !! As usual Loved the presentation..
i appreciate your patience for making us this tart from scratch. your passion for photography is so magical and always brings out a perfect treat for eyes..
Beautiful clicks .Tarts look scrumpticious. WONDERFUL BLOG...AMAZING PICS...U R A GENIUS Nithya....GREAT JOB! Thanks for sharing so many yummy vegan and vegetarian recipes. 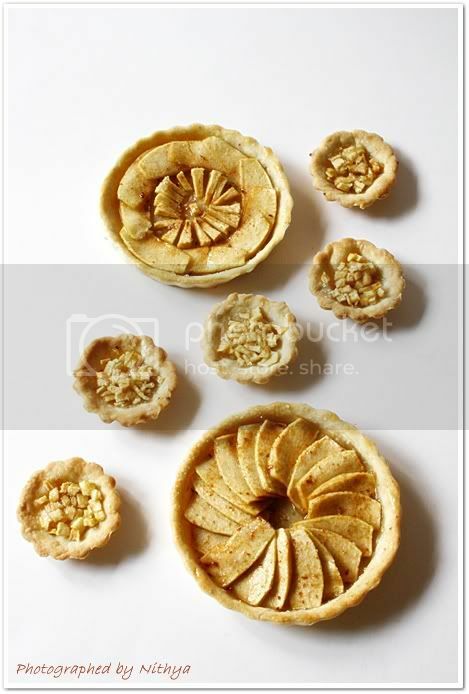 Perfect tarts,I love the lil ones,they are very cute..
Lovely clicks and an equally tempting recipe. I just love the Apple ! I tried baking, but then decided to stick with buying it.. During my initial German days, Apfeltasche (apple puf) used to be my breakfast !! A here is a quick recipe.. peel apples, cut, put into pressure cooker, add just little water, a little sugar and cinnamon powder. Cook well and smash the apples into a paste. Its called Apfelmus. Use it as a dip in just anything spicy, best with cutlets. Heaven !! I have just about read all your posts. Fantastic is a small word! and the pics, class !! keep them coming ! 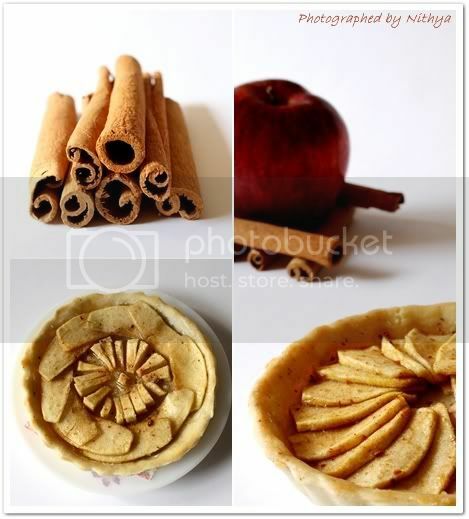 Nicely presented, apple tarts are delicious one with cinnamon smells very festive and christmassy!! !